I'd been waiting for Shibumi to open since I first learned about the restaurant towards the end of 2015. 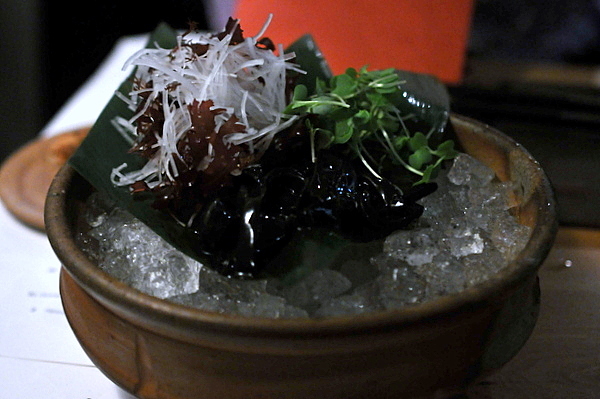 Shibumi is the brainchild of David Schlosser who previously worked at both Urasawa and Ginza Sushi-ko as well as various kaiseki restaurants in Japan. Joining him as CdC is Jacob Kear who did a stint at Noma Japan. Originally scheduled to open in February of this year, the repeated delays only hightened my eagerness. 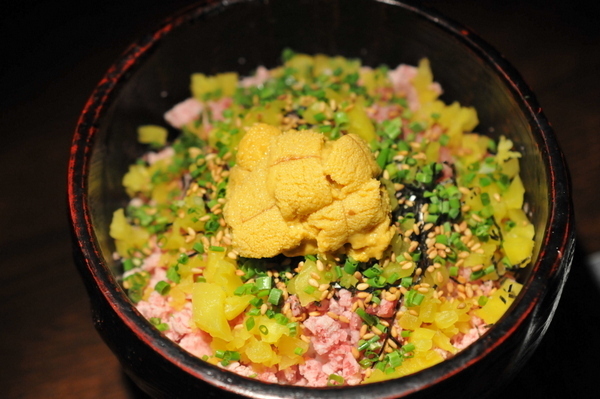 Shibumi's emphasis on Kappo style cooking was a welcome change of pace from the sushi, ramen, and yakitori places that typically dominate Japanese restaurant scene in Los Angeles. The restaurant had planned to offer a higher-end kaiseki option, but when I made my reservation we learned that the team was going to focus solely on the Kappo menu to start. 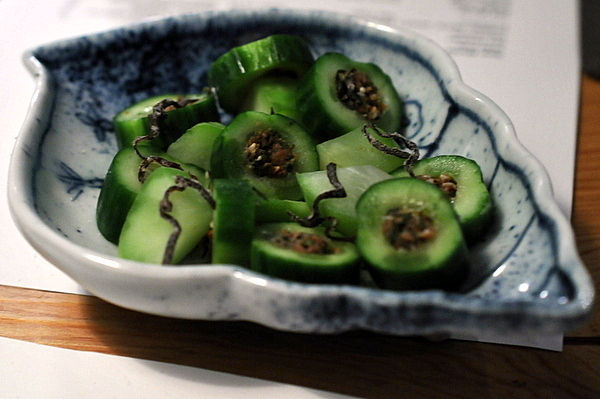 The pickled tang of the stuffed cucumbers was tinged with funky notes from the umeboshi and a pleasing freshness from the shiso while the seeds added a contrasting meatiness to the morsel. A couple of end pieces of the cucumber came without any stuffing and the entire table found these unpleasantly salty and rather blunt. Next up was a bed of fresh crudite (radishes, carrots, and snap peas) served over a bed of ice, the chilling effect of the ice helped highlight the crispness of the vegetables. 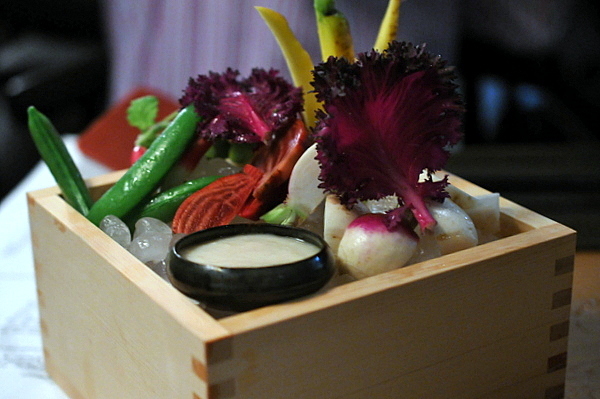 In keeping with Shibumi's ethos, the vegetables were served with little adornment besides a creamy rice dip that tasted reminiscent of a mild sweet miso. The dip helped to temper the aggressive bitterness of the radishes but the overall dish was underwhelming. I can understand the desire to show off the natural flavor of the ingredients but $11 seems a bit much for a small platter of unseasoned raw vegetables that I could buy at my local farmer's market. Next up was Tai served Edo-style. 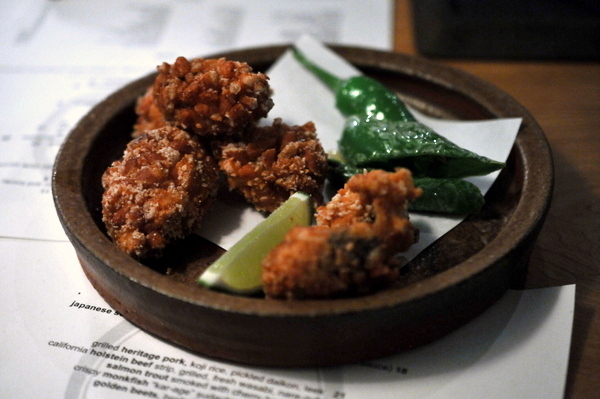 The fish had a dense texture and plenty of saline heft that was deftly balanced by the tanginess of the plum sauce. 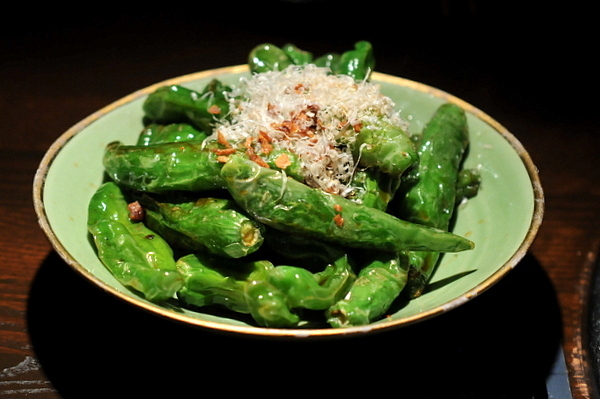 Meanwhile the slivers of fresh myoga added a peppery spice and much-needed succulence. The cuttlefish was easily the most intimidating course of the night with its glossy oil black coating of ink to the pungent flavor of raw fishy saline. 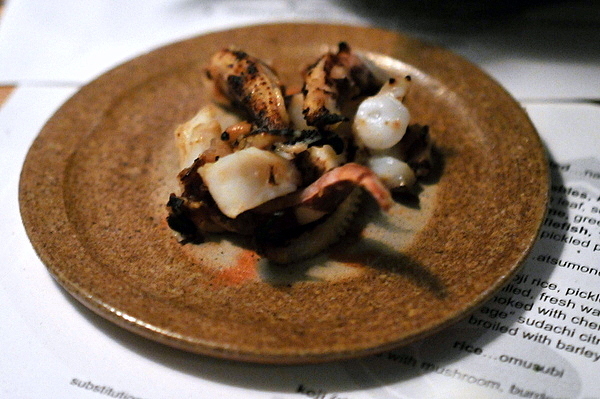 The grilled tentacles were much more approachable, still giving off intrinsic saline notes but with pleasing notes of char and smoke. I wasn't expecting much from this course but the mild sweetness of the beets was quite enjoyable especially when tempered with the light bitterness of the greens and the warm soothing maltiness of the barley. This was probably the table favorite and with good reason. Beneath the layer of crispy batter the fish still displayed a wonderfully moist flakiness. The generous dusting of kelp salt drew out the fish's natural flavor but was kept in check by a quick squeeze of sudachi. Despite being called smoked the fish had a well cooked exterior wrapped around a core of supple pink flesh. 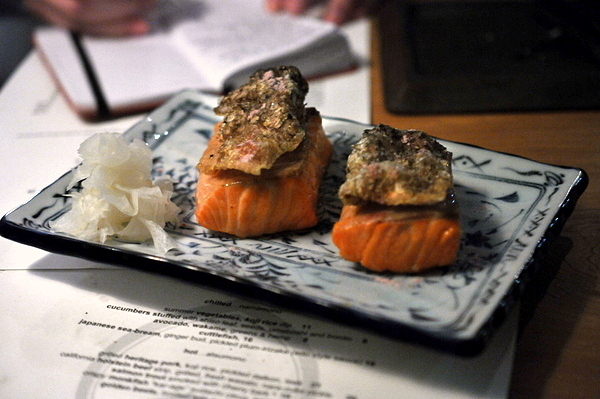 The soft whiff of wood smoke emanating from the fish worked nicely with the shredded daikon which was quite reminiscent of a sauerkraut while the fragment of crispy skin provided an unabashedly salty accent. 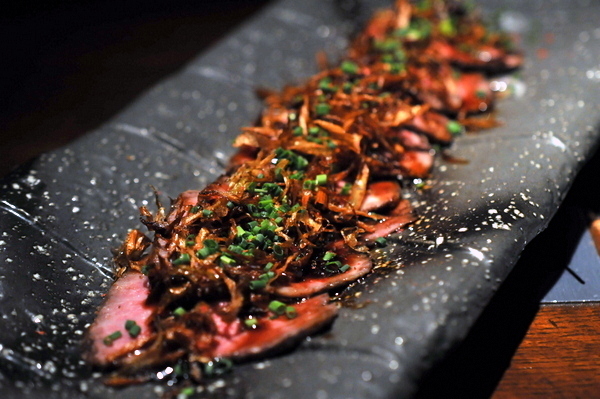 The strip steak was served in two markedly different styles. First up was a slightly overdone steak topped with wasabi, while the combination was enjoyable I thought the short lived bite of the wasabi didn't match up with the rich beefy flavor. The pickle, marinated for 2-years, proved to be a more effective counterpoint thanks to its lingering sweet and sour pungency. 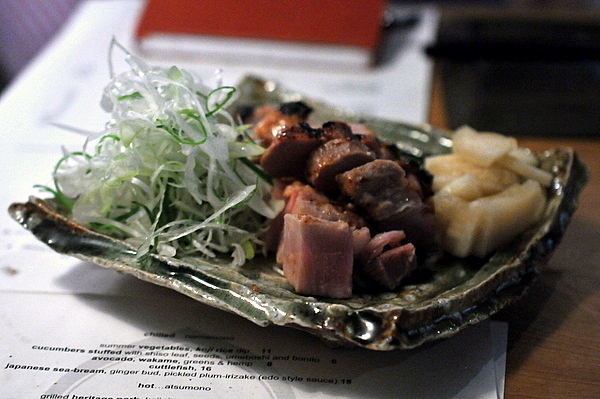 The pork was served unusually rare and proved to be all the better for it. The meat's rich fat, coupled with the light sweetness of the koji rice sauce was sublime with the scallion-like character of the leeks. 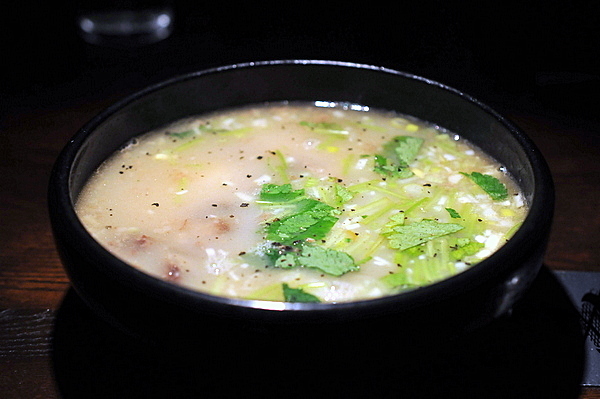 A slice or two of thick succulent daikon washed down the fat with a crisp and tart efficiency. I don't think I've ever had tofu made from apricot seed and after this experience I'm not keen to have it again. 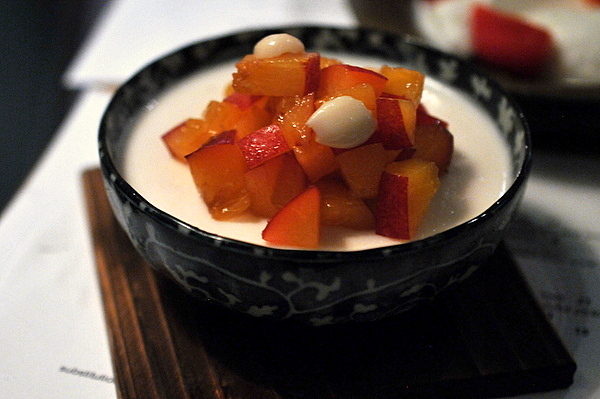 The tofu is dry to the point of being tannic and the fresh fruit does little to alleviate the sensation. 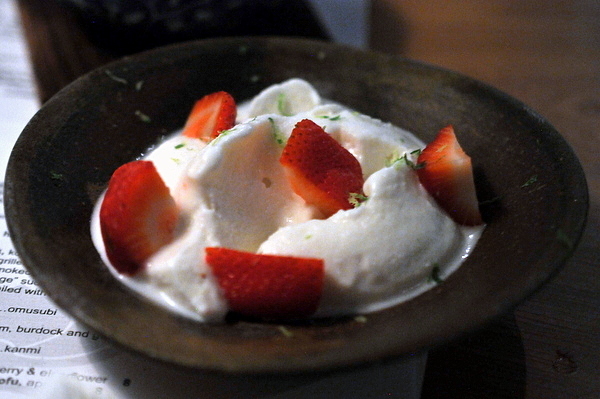 This was a nice riff on a classic flavor combination pairing sweet cream with strawberry and a flourish of citrus zest. 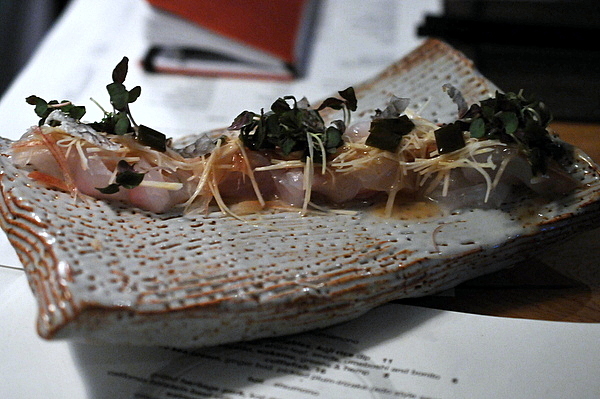 Shibumi was without a doubt my most anticipated opening for the year. My enthusiasm was tempered a bit when I learned that the Kaiseki menu wasn't going to be available immediately, but not enough to stop me from booking a table for opening night. The meal got off to a rocky start when our server spilled a cocktail down my back. I suppose some service gaffes are to be expected and he did comp all of our drinks for the night which seemed more than fair. Schlosser's philosophy of celebrating the natural flavors of the ingredients made some of the courses more cerebral and less enjoyable at a visceral level. 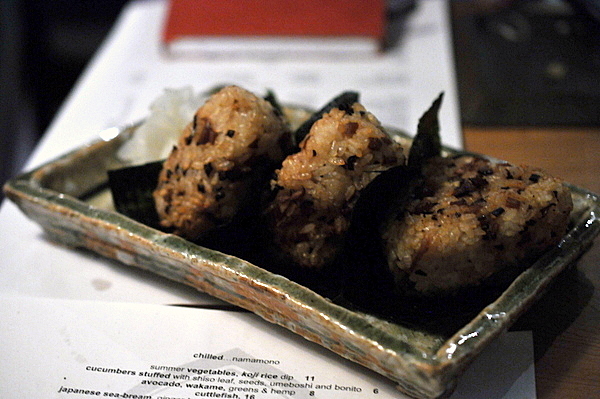 Overall the restaurant shows a fair amount of promise and I'd be happy to return once the Kaiseki menu gets rolled out. I've long considered Totoraku the pinnacle of yakiniku, but the secrecy and artificial exclusivity has always been somewhat off-putting. When I heard that Yazawa, a famous Japanese purveyor of Wagyu beef had opened up shop in Beverly Hills I had high hopes they would give Totoraku a run for its money. 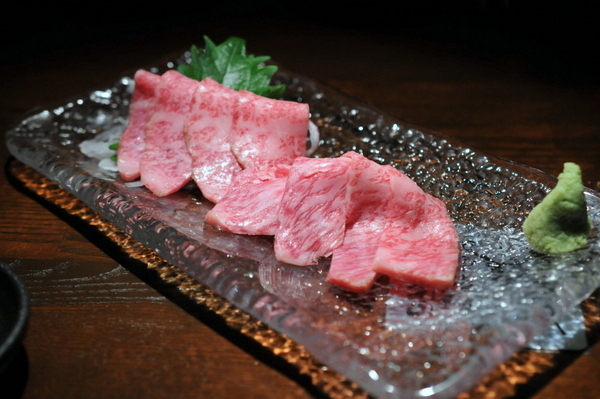 Unlike Totoraku, Yazawa serves beef from a variety of sources including Snake River Farms for its domestic cuts and Wagyu from all over Japan's beef producing regions. Also the restaurant maintains an air of rustic elegance with weathered dark wood paneling and dark leather booths to match. It goes without saying this dish was absolutely delicious but it almost doesn't seem fair, pairing uni, Wagyu and truffle. In terms of flavor the uni and truffle definitely dominate, but the meat adds a complex textural element that is at once slick but with a fine grain that doesn't show up in the cooked meat. Next up was a pretty traditional plate of kim chi though the seasoning used to ferment the vegetables had a bit more bite than I was expecting. The radish and cabbage were pretty traditional but the mountain potato was a nice change of pace, almost like a savory Asian pear. I never thought I'd say this but I guess meat can be too rare but I guess it is possible. 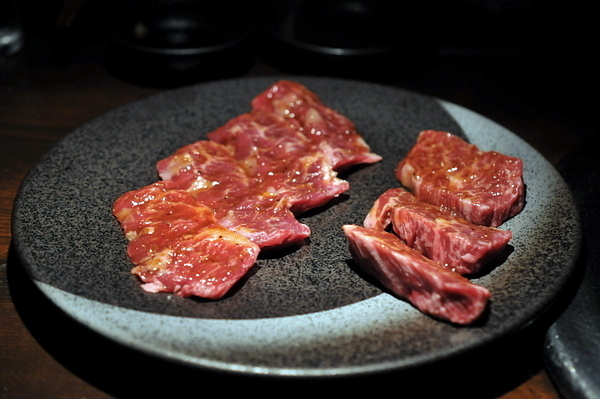 The meat certainly looked beautiful, but it was dense and utterly flavorless like chewing on oily clay. The soy and wasabi help superficially but don't really remedy the issue. 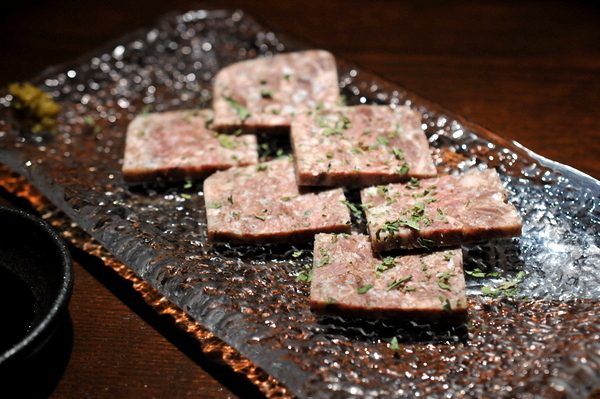 I was a bit skeptical about the idea of a Wagyu terrine thinking that the cooking would render out the best parts of the delicately marbled beef, but the result was effective if a bit non-traditional. 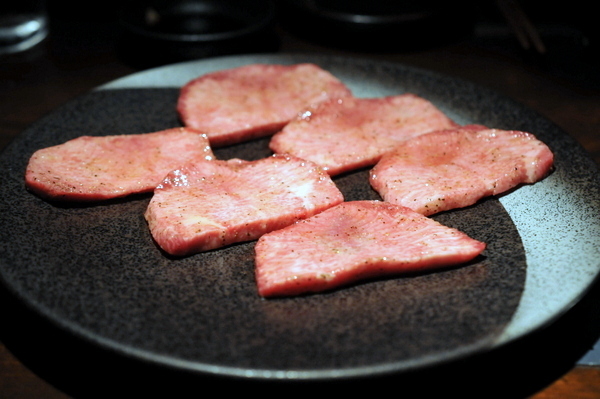 The meat had a tender corned beef-like consistency with a rich buttery flavor and lingering essence of stewed meat. This was a textbook Shishito appetizer; the pepper's verdant smoke wsa augmented by bonito shaving and savory garlic chips. 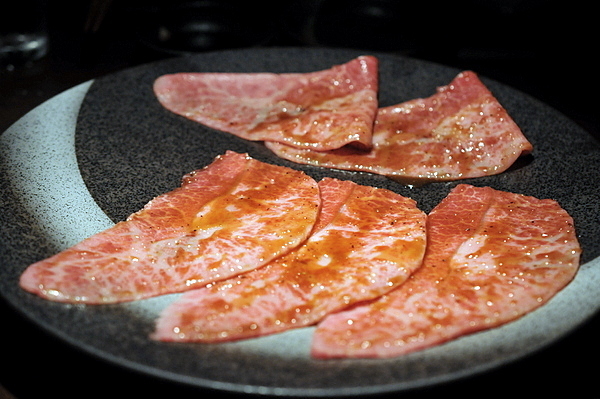 I've typically seen beef tongue in lengua and yakiniku with little variation in between. This was an intriguing compromise. The tongue had a tenderness thanks to the braising but with a pleasing snap at its pinkish core. 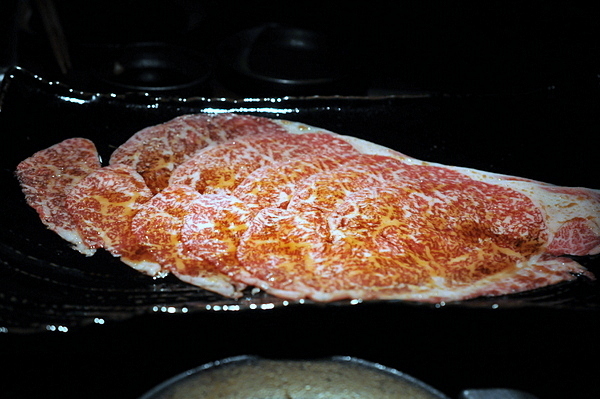 Yet another wonderful cooked Wagyu preparation. The moist Wagyu had the hearty flavor of a traditional roast beef with a heady savor from the onion and a touch of countervailing tang from the balsamic. 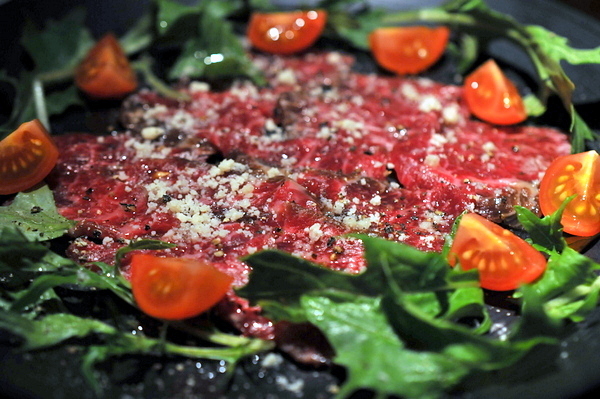 The Bresaola proved to be the table favorite among a slate of very strong beef appetizers. The curing gives the beef a deep burgundy color and beautifully dense tenderness. The higher fat content and brine makes the flavor aggressively salty and rich making the tomatoes and arugula the ideal compliment to the meat. 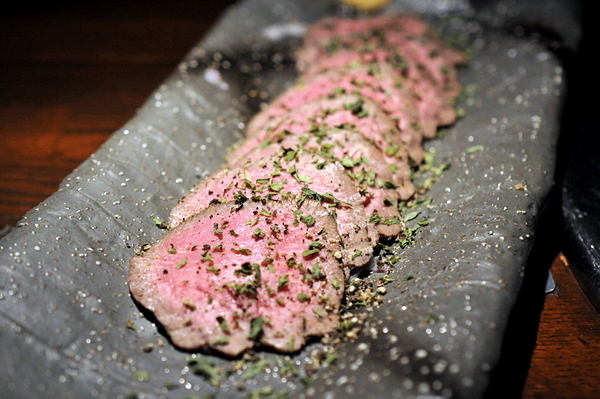 Yazawa serves their tongue noticeably thicker than most other yakiniku restaurants. 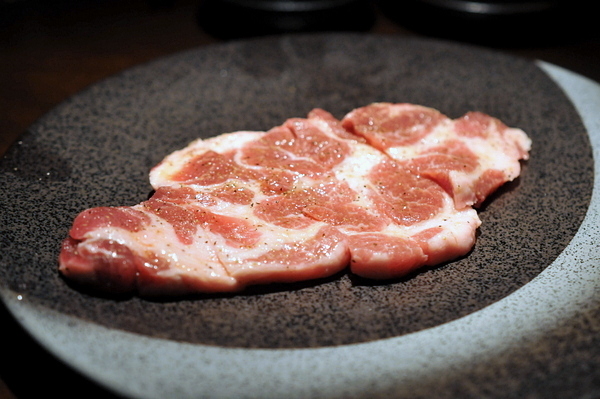 Consequently, the meat can stand more time on the grill resulting is a more multifaceted texture with some nice crispness and char on the edges yet still snappy at the core. This is the restaurant's signature cut and at $28 per slice the only one where the staff makes a point to cook the meat for their guests. The result is sublime, a silky lissome sheet of perfectly marbled beef that balanced the rich oily fat with plenty of beefy heft. The meat comes in a sweet marinade and egg dipping sauce but can be enjoyed on its own. Our second round of beef started with the outside skirt steak from Snake River Farms. 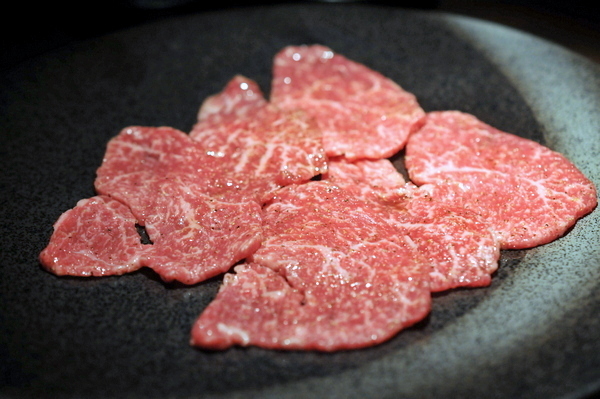 The meat has an appreciable heft and much firmer grain than its Japanese counterpart though the marbling isn't quite as well integrated. Naturally we couldn't leave without trying the classic Kalbi. 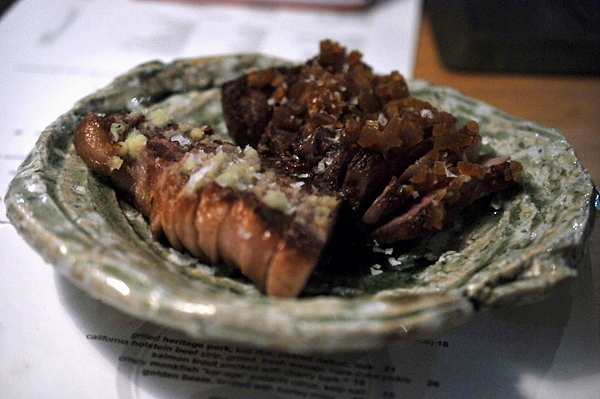 The meat is buttery rich and generally tender though a bit more sinewy than the rest of the courses. We were advised to cook the rib-eye three seconds per side. Personally I found this a bit short as the fat hadn't quite rendered and the exterior hadn't picked up any caramelization. At 5 seconds per side, the meat picked up much more depth, smoke, and tenderness. 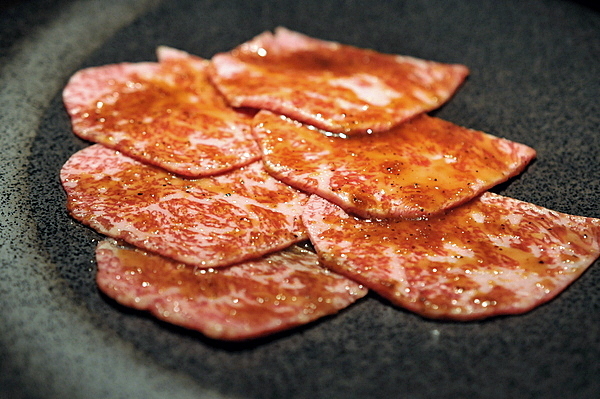 While Yazawa's focus clearly is on high quality beef the restaurant does offer a couple other proteins. The pork was far denser than any of the cuts of beef but remained fairly tender and picked up a nice bacon-y char as the fat rendered. Working our way down the marbling scale we decided to end our night with the Round steak. Markedly leaner than its the texture is still supple and tender though a bit less overtly rich than the Japanese cuts we had earlier. 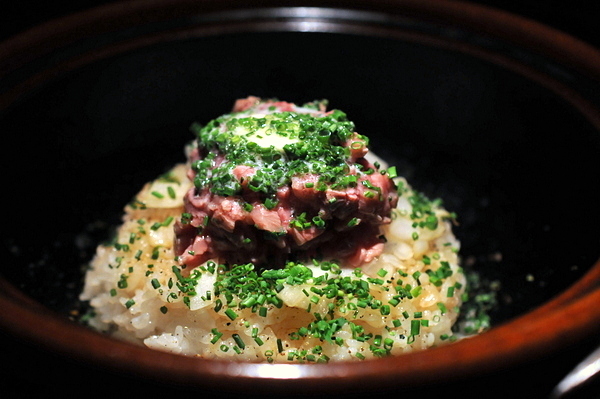 This was basically a rehash of the tartare we had earlier but served on a bed of warm rice. 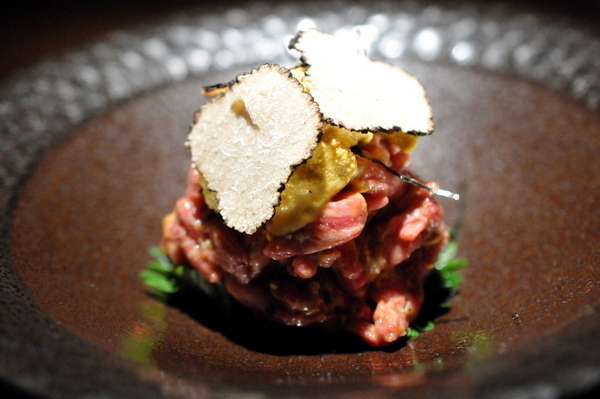 As with the tartare, the beef plays a supporting role to the aromatic decadence of the urchin and truffle. 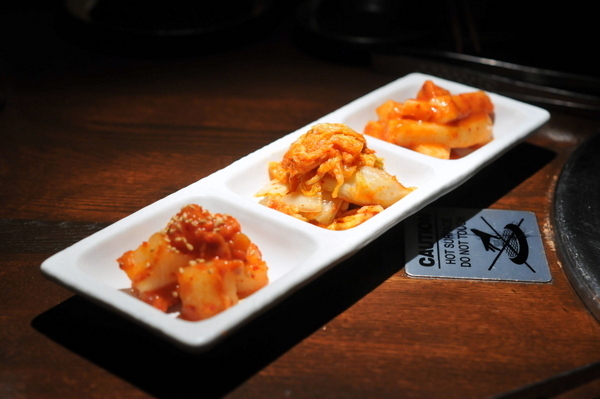 The addition of pickled radish was a nice touch, crunchy and tart, they kept the dish from feeling overly heavy. 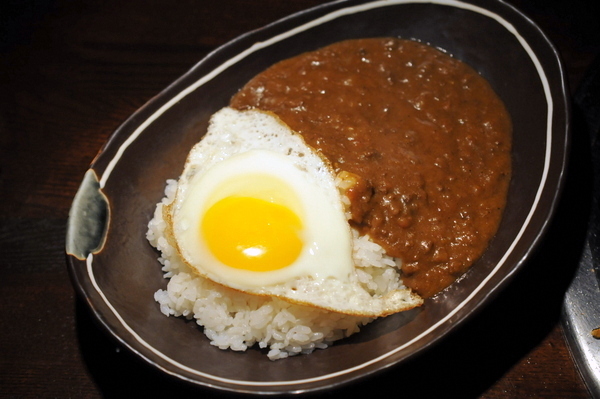 Classic Japanese curry, which would be great but I've never cared much for curry rice. The meat has a hearty stew like flavor and it was hard to really notice what if anything using Wagyu beef did to help the dish. 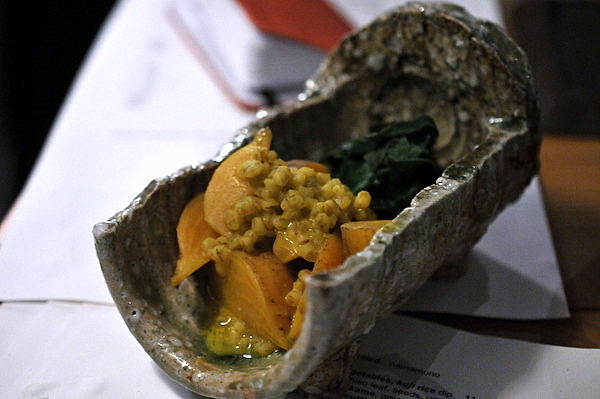 I loved everything about this dish, from its alabaster color to its slightly creamy consistency and rich meaty savor. 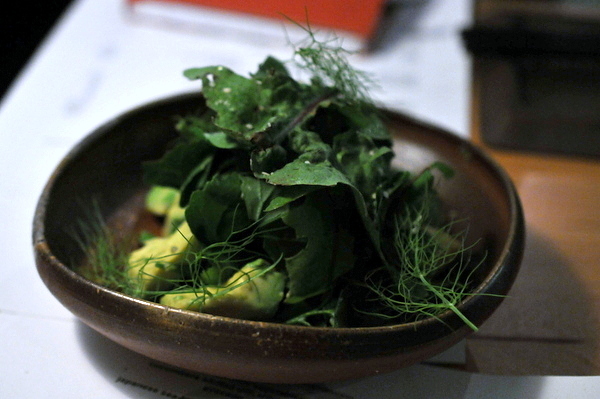 The sprigs of fresh parsley provided a verdant countervailing bitterness while the inclusion of rice lent the dish a nice solidity. Our server recommended this dish and I'm thankful we took him up on his advice. The rice and beef are served in a sizzling pot a la bibimbap that really brought out the flavor of the fried garlic while softening the meat and lightly toasting the rice, easily the best of the rice dishes and probably the best clay pot rice I've ever had. I'm not typically a fan of Dan Dan noodles, but this version wasn't bad. 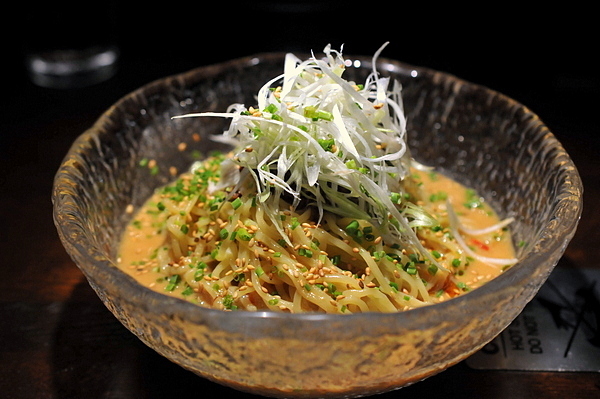 The noodles themselves were cold and dense while the characteristic peanut flavor is replaced with sesame and tempered by a surprisingly healthy dose of chili. 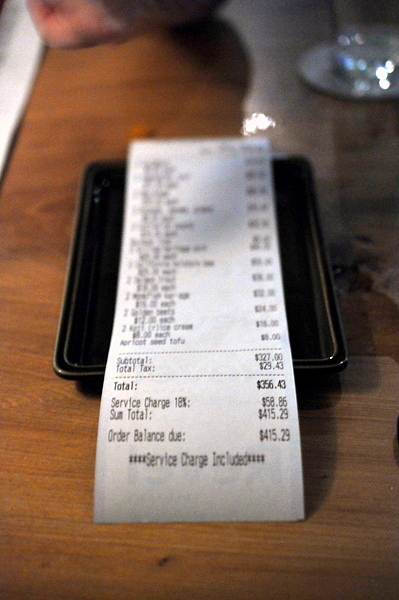 My only real complaint was the $36 we were charged for tea. At $4 a cup, please inform guests that refills aren't free and don't replace half-finished cups without asking first. 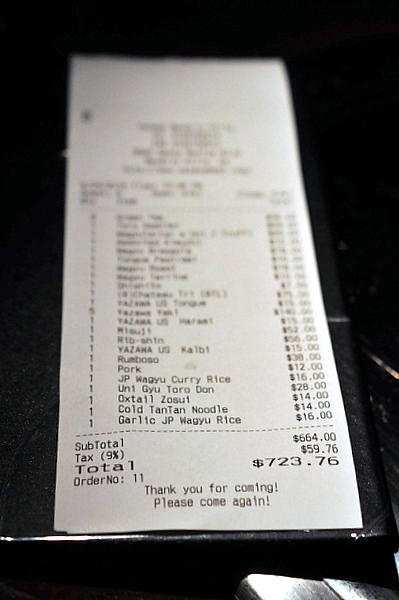 Our meal came to north of $125 per person so the additional $24 for refills just feels excessive. In terms of food, Yazawa met my expectations and then some. 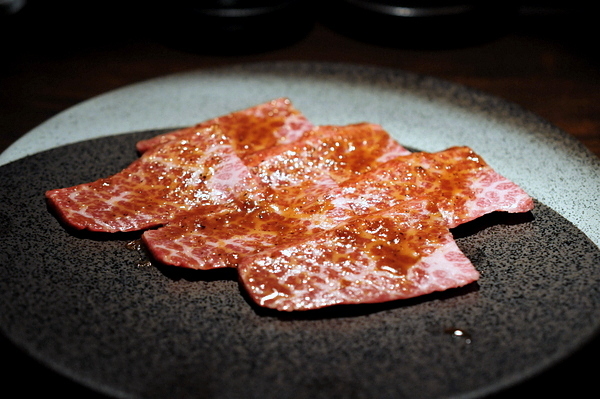 The beef was stellar from start to finish; with each cut having its own distinctive character and the appetizers and rice dishes were equally, and in some cases arguably even more impressive. In terms of service the restaurant is clearly a step above most other yakiniku or Korean BBQ places, with the staff changing the cooking surface in between each cut of beef to keep one cut from contaminating the next. The wine list was a bit sparse but as corkage is an option, I highly recommend diners skip the wine list (and the tea) and bring their own wines to pair with the heavenly meat.